Tan y Garn is a tastefully renovated barn conversion. The living quarters are found on the first floor to capture the spectacular sea views which are visible on the quaint side windows or via the stable half door near the kitchen. The property has a newly built stone veranda looking out over Whitesands Bay complete with a 3 person Hot Tub and al fresco dining area. A commanding view of Carn Llidi is clearly visible from the Kitchen skylight and the veranda - it's breathtaking. You are inspired to relax and cook with commanding 360 degree views all around you. Up the original barn steps and through the old-wood stable door, the snug appeal of open plan cottage living can be appreciated. The fully equipped kitchen with its smart American fridge/freezer, dining area and luxury lounge are all tastefully decorated along with vaulted ceiling, slate floor.. The lounge has a wood burner and several eye-catching original features and original local paintings and numbered prints. The benefit of open plan is whether cooking, eating or relaxing in the lounge area, no-one is left out; family & friends can still contribute to any conversations or take pleasure in watching a movie whilst cooking, washing up or sitting at the dinner table. The ground floor houses a bright, well decorated double bedroom with newly laundered linen with en suite shower. The bunk room with single day-bed benefits from a separate shower & bathroom, to have a good soak & ease the day away. There are countless activities to enjoy ! Why not pack a picnic and take a leisurely walk along the Pembrokeshire Coastal Path which is virtually on your doorstep. Meander up Carn Llidi, to absorb the full beauty of the coastline and visit some of its historical sites. Alternatively, spend your days on Whitesands Beach, renowned as one of the top beaches in the country, popular with families and a hotspot for keen surfers and beginners alike with its seasonal water sports hire shop and cafe all in short & easy walking distance. Walkers, surfers and dog owners are well provided for and several beaches have stretches that allow dogs on all year round which are wonderful for families and their pets. The historical tiny City of St David’s is only a short drive away with its Bishop’s Palace and Cathedral. There are a host of independent shops, restaurants and pubs to sample. For those who fancy a short sea excursion and have an interest in our feathered friends, St. Justinian’s offer boat trips to Ramsey Island Bird Sanctuary. Tan y Garn is set next door to Upper Porthmawr, ideal for larger groups that would like to rent both properties together. Wonderful cottage on the Pembrokeshire Coast Path. We spent a lovely time there. Full equipped kitchen, amazing views, and a perfect outdoor hot tub (just check that is correctly switch on on arrival). Recommended. Roedd Tan y Garn yn fwthyn clyd a hynod o gyffyrddus. Mae'r lleoliad yn arbennig gyda Carn Llidi tu ôl a Traeth Mawr yn ymestyn o'n blaen. Cawsom amser hyfryd ac ymlaciol a byddem yn sicr yn argymell. Tan y Garn is a cosy and exceptionally comfortable cottage. The setting is beautiful in the shelter of Carn Llidi with an amazing view of Whitesands Bay. We had a lovely, restful stay and would definitely recommend. We had such a lovely week in Wales, can’t recommend it highly enough. The hot tub was the icing on the cake! I can't recommend this place highly enough. The scenery is beautiful, the wildlife fabulous (lots of seals and dolphins just off the coast) and the local city of St David's is tiny but has excellent food shops selling local produce and good places to eat and drink. The cottage is one of the nicest places I've ever stayed. It has a very cosy and well-designed interior and great views. And the owners are lovely. 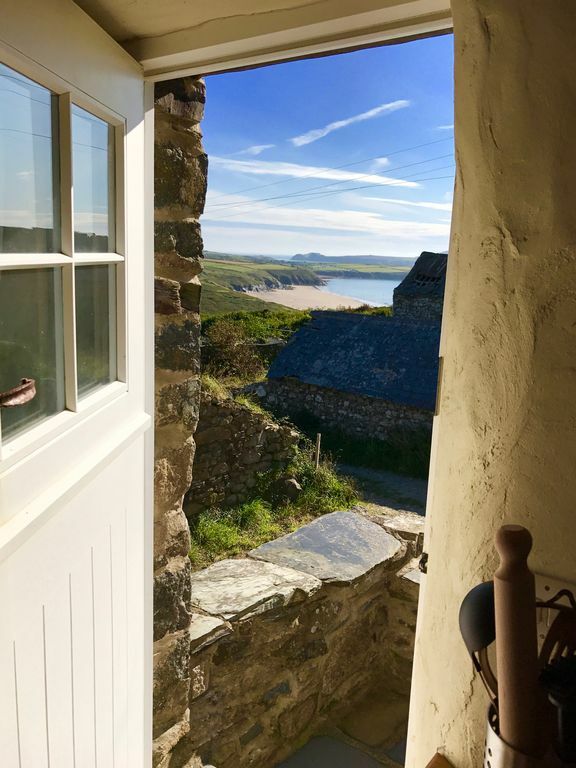 We had a wonderful holiday in St Davids and loved the location of this property, I could have stood and looked out at the waves rolling onto Whitesands beach from the stable door, all day long! The new owners are making changes and we enjoyed the new hot tub and outside verandah. There is a golf course on the opposite hillside which my husband spent many a happy hour getting to know and the beach is perfect for bodyboarding. Mair and Emyr made us very welcome and were quick to respond to any queries we had. A lovely part of the world to stay in.